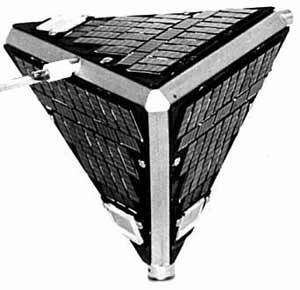 The basic configuration of the TRS Mk.1 spacecrafts was a regular octahedron measuring 16 cm on a side. Solar cells mounted on each side of the faces provide sufficient electrical power to operate the experiments and the telemetry system when the satellite is illuminated by the sun. No internal battery or command system were provided. The satellite subsystems consisted of electrical power, antenna, telemetry, experiments, and mechanical structure. TRS 9 (ERS 9): measured radiation damage to silicon solar cell samples. For this the satellite carried 132 n-on-p solar cells of which twenty were part of five experiment samples of four cells each, which included unshielded and shielded cells. There were also shielded and unshielded p-on-n solar cells. Data returned during the 11 days that information was collected, was correlated with data gathered by TRS-5 and TRS-6. The satellite's mass was 1.5 kg.